Buy Bird Cherry Tree (Prunus padus) online from UK tree supplier of cell grown broadleaf hedges and shrubs. 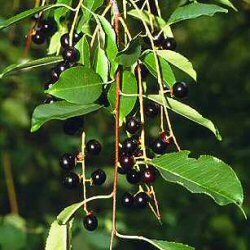 A native British tree of Scotland, northern England and Ireland, Bird Cherry (Prunus padus) is frequently found along riversides. It has a slender form and has attractive white flowers in spring. Small dark cherries, which are used in preserves, wine and the flavouring of gin. Expect a final height of 15m (50ft). Typically, Bird Cherry is planted in groups of between 10 and 25 trees. This number of trees is ideal for creating a wildlife habitat and a meaningful source of food and shelter. Spacing may vary between 1m (3ft 4in) and 5m (16ft 8in). The aim is to mimic what nature intended and thus avoid artificial lines. Blending of one species into another is suggested although bearing in mind different growth rates. Bird Cherry is a key native tree species and along with the many other native, British tree and shrub species we sell will form part of an attractive native woodland and encouraging the creation of native habitats.